Star Automations provide best quality repaired ABB robotic components. Motivated to acquire utmost approval of the patrons, we render the best quality of Industrial Robot Spares and Repairing services. Their consistent performance and low maintenance make these robots highly demanded. We offer our clients a qualitative & robust repair & maintenance services at industrial leading prices. Best quality of Kuka Teach Pendant Repairing Service is provided by us to customers as per their requirements. REPAIRING OF ALL TYPES OF MOTOMAN ROBOT PENDENTS, ROBOT SERVO DRIVES, ROBOT SERVO MOTORS ETC. 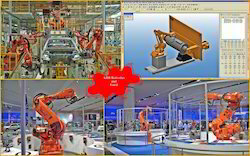 we are proveding all type of painting robot servicing and programming. Konzert Automation & Robotics Pvt. Ltd. Along with our range of premium grade products, we also offer top quality range of Robotics. These Robotics increase the production output rates, improves quality, consistency, product manufacturing facility, etc. Our offered robotics is accurate with great quality and excellent finish. This Robotics is available to our clients at affordable range of prices. With thorough understanding of this business industry, we are engrossed inproviding Robot Repairing Service to our clients. Due to our personnel’s knowledge, we are able to meet the detailed needs of the clients within the given period of time. We have adroit employees, who offer these services in agreement with the defined guidelines. We provide Robot Installation & Commissioning service in Automotive, General and Consumer Goods Industries. We have with us a range of Planetary Gear Box Repairing. These products are widely appreciated among the clients for their high efficiency and maximum torque capacity. As the name suggests, it can adjust with the solar system. Under this range, we provide sun gear, planet gears, the planet gears' carrier and ring gear.